Well, my friends, it has been quite a WEEK. I tried to slack-off, I really did. Despite my best efforts I actually earned my pay this week. In fact, I may have kicked some well-needed booty too. (I’m being cheeky – just go with it). No, but really, work is killing me. Like, to death. I have worked 10-12 hour days entirely too much this week. Early meetings with the Brits and late evenings playing catch up. I don’t typically talk about work here – and I’m not going to start now – but because of the horrendous week I seriously need a pick me up and OH MY GAWD thank goodness it’s Friday. Friday before a 3-day weekend no less – bonus! On Saturday we got our 7 year old a big boy bike and, oh my goodness, he’s actually a BIG BOY now. But he’s my baby too. Tear. He and his brother spent the weekend riding bikes together. 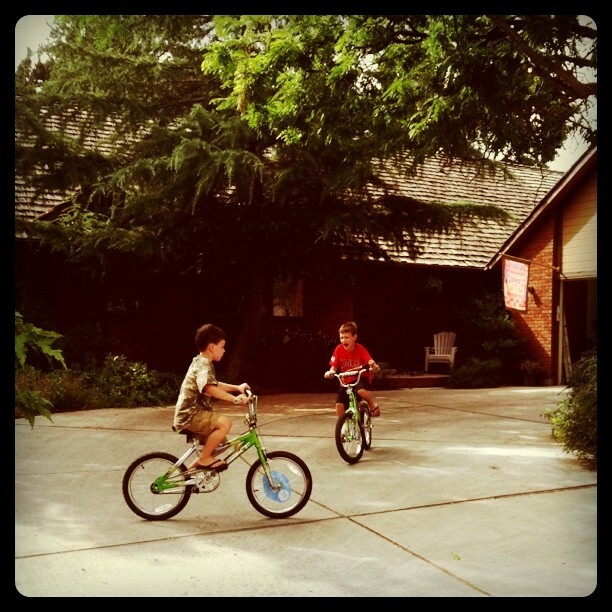 Look at them on bikes together. Just LOOK. It was just YESTERDAY when they were babies, right? 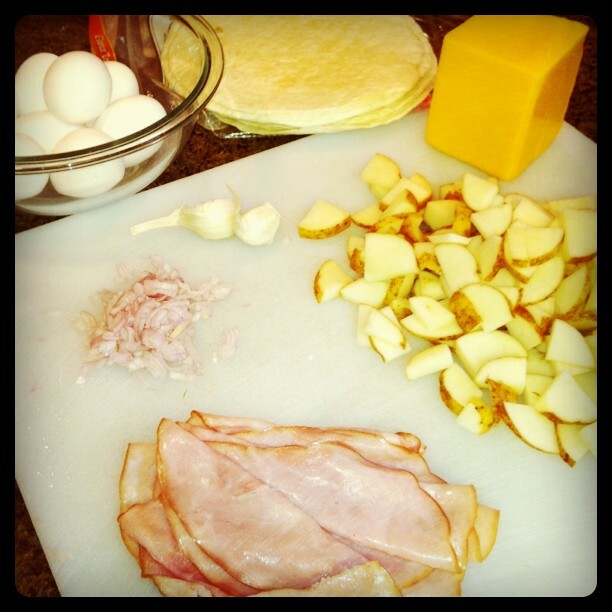 Because I knew I had a heinous week ahead at work and with my little one starting school this week I decided to make breakfast burritos in advance. 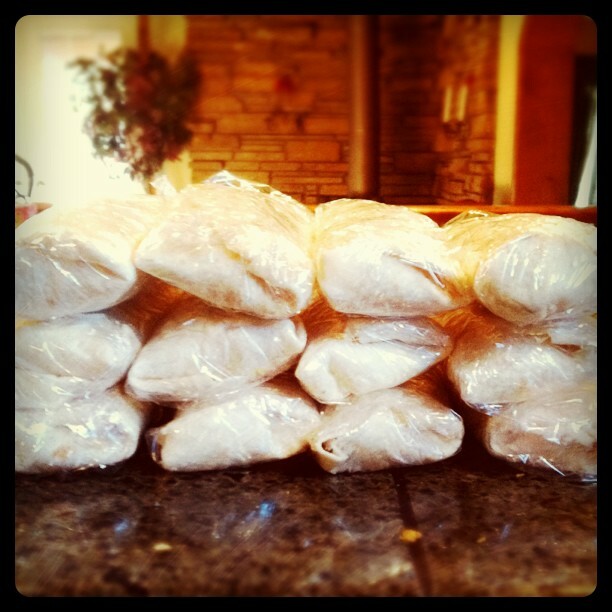 And apparently I made 12. Aren’t these pretty? 45 seconds in the microwave and I have a portable, protein-rich breakfast meal. Yum. Monday night I made fried rice for the first time. No pictures. I was in the zone. It turned out well. I said YUM and so did the hubby. Tuesday I made pesto for the first time ever. Seriously! And with basil from my own garden. It was so, so good. 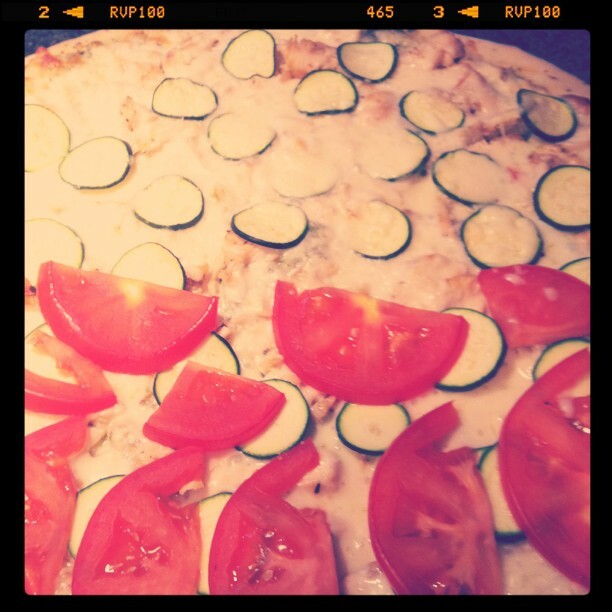 And then I cooked some chicken, baked some pizza dough and threw it all together with zucchini and tomato for a yummylicious pizza. Like whoa. And I’ve been obsessed with fruit this week. 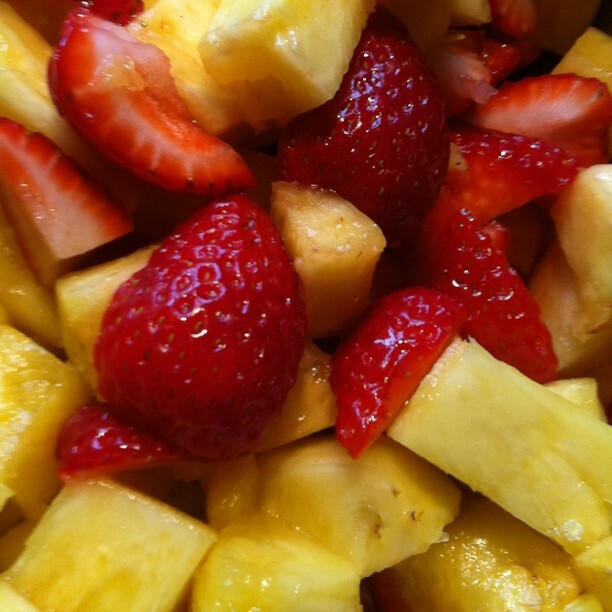 Pineapples and strawberries are manna straight from heaven. (I didn’t really cook anything here, except some whipped cream. I just had to include the picture because of the YUM factor). It’s a good thing I’ve munched on so much fruit because tonight I decided to make sweet potato tempura. Deep fried (oh the horror) with a Greek yogurt and garlic dip. I ate it too quickly to take pictures. Nom nom. I’ve also managed to work-out a couple times this week so far. Last night I really wanted dessert but I put my work-out clothes on and GOT ON THE ELLIPTICAL INSTEAD. Gasp. I can hardly believe it myself. I must have been a rainbow sherbetty blur on the elliptical in my pink yoga pants, orange tank and teal blue sports bra. Stylish, I am. (Thank goodness my husband loves me). But do you want to know the best thing I did this week? The very best? I was a mom to my boys. I squeezed them and kissed them and tucked them in at night. I sang a lullaby to them every night before bed. I got them up in the morning and picked out their clothes and helped them get ready for school. I fed them. I cuddled them. I loved them. I made this one giggle and smile naturally. 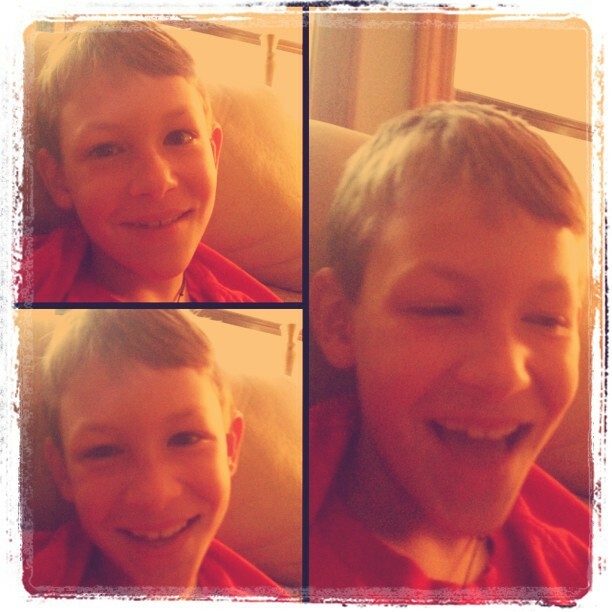 He doesn’t do that much; he’s usually all about the cheesy fake smile when the camera comes out. 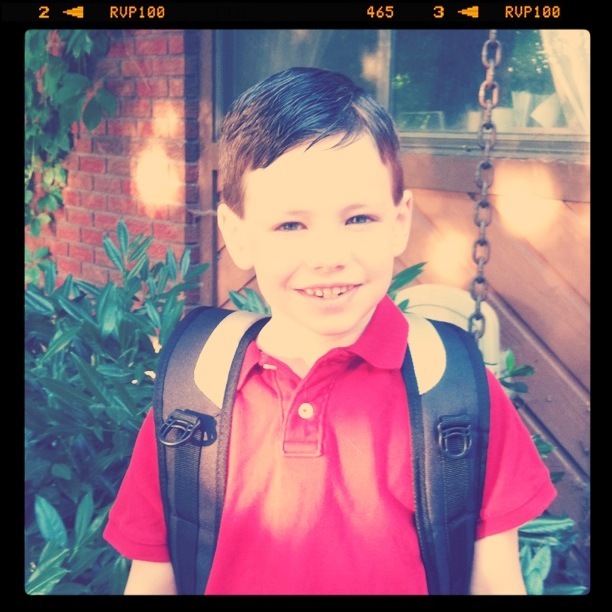 And I got this one off on his first day of 2nd grade at a new school. I was so nervous, and we had some hitches from, as my mother-in-law put it, the “ineptitude of the adults around him” (not meaning us, but school & district officials) and he, my little dude, just breezed through and he’s adjusting wonderfully. And that, my friends, has been my week. I guess it was pretty awesome after all.